Sink into the blissful medley of mangrove wood, hyacinth and coral flowers, beautifully captured in the purest fragrance diffuser. Inspired by the vibrant hue of turquoise, this heady fragrance infuses your home with long-lasting freshness, for a bright and creative space. Part of our exclusive Colour Therapy range - a collection of fragrances influenced by the joy of colour - the Parks Luxury Turquoise Diffuser brings the energy, power and creativity of turquoise to your home. This exclusive scent collection invokes the wonder of Feng Shui, with each scent chosen to reflect the character and mood-lifting element of colour. 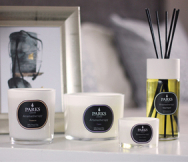 At Parks, our fragrance experts have captured the bright freshness of turquoise in the purest perfume diffuser, creating a timeless scent that's perfect in the bathroom, kitchen or any other room in your home that's in need of a colourful uplift. Each ingredient has been carefully selected to embody the spirit of turquoise, from the sprightly exotic tang of coral flower to the soft balsamic warmth of mangrove wood and the fresh floral allure of hyacinth. Together, these powerful scents combine to create a breezy and captivating fragrance that will set a light and creative tone in your home. Combining a blend of scents, this luxury perfume diffuser can bring powerful and long-lasting fragrance to your home for up to 14 weeks. The diffuser is lovingly packaged in a presentation gift box, making it the ideal gift when you're looking to brighten up someone's day.